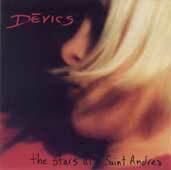 A few years ago i picked up My Beautiful SInking Ship, a previous Devics album. There was tremendous potential hinted at in that album, but the potential was never quite met. A simple analogy i used to describe the band to others at that time was "A less realized Jody Grind", drawing a similarity between the voicework of Sara Lov and that of Kelly Hogan, back when Kelly cared to really sing. Overall, though, the music never really jelled. Oh sure, there were beautiful moments, but everything seemed messy, unfocused. It's as if, perhaps, there was too much talent going on. Well, Devics are now stripped down to just two members: multi-instrumentalist Dustin O'Halloran and vocalist Sara Lov. The results are, quite simply, stunning. The new Devics incarnation have finally suceeded in creating the sultry slow pop masterpiece that their previous work hinted at. The music on The Stars at St. Andrea blends pop and jazz and a hint of western into a simmering blend. Lov really shines, using her voice to full effect, from husky and deep to light and delicate. O'Halloran, apparently, never needed any other musicians, since it appears that he did everything on the album except sing the female lead. The music is light, never too complicated, but very appropriate for the delicate song structures. No one element stnads out really, although at times the voice is obviously front and center, while at other times it is the slide guitar, or the bass, or the piano. Rhythm tends to be a steady by light high-hat heavy beat, like the drumming i associate with late jazz. An obvious reference point is Lone Justice. Lov is a vocalist on par with Maria McKee, and there is a certain "desertness" to the music of both bands. However, while Lone Justice are deep texas desert, Devics are an LA band -- there desert id the crowded Southern California inlands. That's where the light West Coast Jazz feel comes in. There are so many great songs on this album that it is hard to know where to start. Well, the album does lead off with Red Morning, which i went over when i reviewed the 7". This tune proved to be one of my favorites of 2003. I have already reviewed the first single off of this album, Red Morning. That's just a wonderful song, and it is also the lead off to this album. The electronic nature of the production also shows through in The End and the Beginning. In general this is a slow and lovely song, with chugging electronically distorted rhythm and piano. In contrast is the darker work fo Devics. My True Love is a big dark song, it is the fusion of Western and Goth that Atlanta-band Myssouri has been striving for all of these years. Perhaps Mr. Bradley should consider hiring a female vocalist? It really works for Devics on this song. However, the goth thing doesn't really work all of the time. The album's one mis-step is the overly precious Connected by a String. Lov's voice here is massively distorted, as if the vocals are a recording from a movie from the 1930's -- one of the first "talkies", all scratchy and with distorted treble. Combine this with the tinkling piano and the eerie guitar and the whole thing just seems overdone. It tries to hard to be dark and mysterious. In fact, this is the one tune on this album that reminds me directly of Devics work on My Beautiful Sinking Ship. But that's really it for weak spots. Otherwise this is a good, solid album. Devics have really created something wonderful here. If you enjoy pop music, i urge you to find a copy. Red Morning b/w Sunny, the first 7" single off of this album.